It’s snowing in Maryland! The office is closed and I am holed up at home with a fire roaring and Teddy napping. I’m taking advantage of the unexpected playtime by listening to The Girl Next Door (my new favorite podcast! ), writing, and reflecting on a few random things. One of my favorite things so far in 2018 has been a new Facebook group I’m in called We Like Big Books and We Cannot Lie! It was started by a hilarious and wonderful friend of my sister, and it’s basically a big group of people who love books and reading and love talking about books and reading. I’ve gotten a ton of great recommendations for books I wouldn’t have even heard of. Reading a lot of books is not really a goal of mine, so this sort of happened by accident. But I think it helps that I’ve had an amazing group of people making recommendations and encouraging me to read outside my comfort zone. One of my other unplanned accomplishments in 2018 so far is this: I have given up caffeine. I didn’t really plan on tackling this, but Tee decided to switch to decaf coffee to help with sleep, and I decided to join her. It was a tiny bit about solidarity and supporting Tee, but my decision to give it up was mostly because it gets uncomfortable being ‘addicted’ to a substance, even if that substance is caffeine. When I’d get stressed, I’d immediately reach for a diet Coke or a coffee. It got expensive and annoying; I don’t want to have to reach for something external to deal with internal anxiety or stress. Additionally, I frequently had to reach for Tylenol PM to aid my sleep, if I drank too much caffeine during the day. Last night as I was falling asleep, I realized that it was several days since I’d had to reach for a sleep aid to help myself. I’ve been sleeping more deeply and waking up more easily. It’s wonderful. During the fall of 2017, Hillary Rodham Clinton was interviewed on my favorite podcast, Call Your Girlfriend. She was featured on a bunch of podcasts right around that time; it was soon after her book, What Happened, was released. It was bittersweet, listening to these interviews; HRC may be a complicated and flawed individual (aren’t we all? ), but there’s no doubt in my mind that she would be a more competent leader than our current president. However – that’s not why I’m mentioning HRC today. The real reason she’s on my mind is that, in that September 2017 interview on CYG, she became one of my Reliable Book Recommenders. I’ve blogged about this previously, but to restate: not everyone in your life is a Reliable Book Recommender. I have amazing friends – best friends – who are readers, and have a lot in common with me, and yet are UNRELIABLE Book Recommenders. Our taste in books just does not match up. During the CYG interview, HRC mentioned being a fan of the Elena Ferrante novels, which I loooooved. Moments later, she mentioned a different writer, someone I’d never heard of before: Louise Penny, a Canadian author who (according to HRC) had famously authored the Chief Inspector Gamache murder mystery series. Now, since HRC had endorsed the Ferrante novels, I knew we had at least some overlap in our reading tastes. And I adore mystery novels – well-written ones, that is. So I requested Louise Penny’s first novel, Still Life, from the Baltimore County Public Library. It’s five months later, and I recently finished the 13th book in the series. OH MY GOSH I LOVE THESE BOOKS SO MUCH. 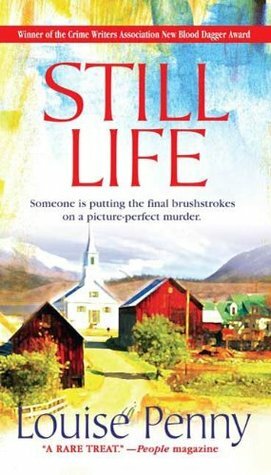 Each book contains a murder mystery, but there’s a group of characters – Chief Inspector Gamache and his family, his second-in-command Jean Guy Beauvoir; and a small circle of friends who live in a quaint village in the Quebec countryside called Three Pines – that are present throughout the series. The murder mystery is usually interesting and compelling, but I find that I’m more intrigued by the staple characters than I am by the mystery Gamache is solving. Each character has a compelling back story, personality, and personal journey, and I really love spending time in Three Pines. When I finished Book 13, I was worried that it might be the last in the series; luckily, I started following Louise Penny on Facebook, and learned that Book 14 should be released sometime during 2018! One of the reasons I have Louise Penny’s books on my mind is that I learned a little about her story. She started writing full-time in her late thirties, and her first novel was published in her forties. I find this an inspiring, not depressing, timeline. And, as I’m thinking more and more about working on a longer piece of fiction writing, I am very much in need of inspiring timelines! One of the things I am most excited about is that idea of creating a cast of characters that I can revisit again and again throughout a series. It means I don’t have to resolve everything in one book. I think that will also help with my instinct to tie everything up with a bow at the end of a story or novel; if I know I’m writing a series, it can be more of a slow burn. SO EXCITED. SO INSPIRED. SO ENCOURAGED. The mystery novels of Louise Penny. SO FREAKING GOOD. I started them in the fall (recommended by Hillary Rodham Clinton herself, who is so far a Reliable Book Recommender), and I read all thirteen by the beginning of 2018. Plus, she announced recently that another book will come out this year. Yay! This quote from W. Kamau Bell’s book : “Being in my twenties was not helpful for my comedy development because I had nothing going on to talk about. It wasn’t until I got to my thirties that I had real material.” I have a constant voice in my head whispering that it’s too late to be a writer. SHUT UP VOICE KAMAU SAYS NOW IS THE PERFECT TIME. Finding time to meditate. I’ve been working hard to remember to make time to meditate, and I’ve been doing pretty well. This was one of my New Year’s Resolutions, and it’s really important to me that I keep it; I’ve been coming to terms with the knowledge that I’m a pretty anxious person, and I believe me ditation will help me to calm my mind during those paralyzing anxious moments. I’m hoping that a little bit of discipline – sticking with a routine of meditating every day – will help me to increase my overall joy. Rediscovering Buddhism. I read Buddhism Plain and Simple, by Steve Hagen, about 15 years ago; that was my first introduction to Buddhism, and I loved it. Now I’m reading another Hagen book, Buddhism Is Not What You Think, and I’ve really been enjoying it. I’m thinking about making a habit out of always having a spiritual book close by; sometimes just reading a few pages out of a book about meditation is enough to help me calm my mind. Enough for now. These posts are kind of a dumping ground for random thoughts, but my mind clears up after I write them, so – worth it. There’s a story – possibly a long-ish work of fiction – bubbling up in my mind. However, I’m in the middle of a seriously crazy Book Binge currently, and I’ve been reading much more than I’ve been writing. The WAY I’ve been reading is a little different this week. While reading this week’s books – including Wonder, The Hate U Give, The Readers Of Broken Wheel Recommend, and Young Jane Young – I’ve been asking myself questions about choices the author made, things I like about the plot or story, and tools I might be able to use. However – my actual writing has been limited. Every day for the past few weeks, when I get done with Teddy’s bedtime routine, I race downstairs to read my current book. I finished the Louise Penny novels, which were incredibly addictive and suspenseful, and then have been flying through book after book after book. I’m a little worried about my lack of actual writing – though I am trying not to be TOO worried. I do want to make writing a priority; I don’t want to put my writing on a back burner for weeks that turn into months that turn into years. Maybe if I give myself a soft deadline – need to have started writing this story-maybe-novel by Valentine’s Day – then it will keep me dedicated without forcing me to do it RIGHT NOW. I’m not great at forcing myself to do things – I’m better when I maintain my faith that it always comes back, whether it’s my desire to read, my energy to run, or my creativity for writing. However – I also don’t want to wake up in a year with this story still bubbling up inside of me. Hopefully this post will bring me some accountability. I am enjoying tossing this story around in my head. Thinking about character quirks and which characters can have them. Having ME Time is exponentially more valuable now that I’m a parent. This morning, I was gifted an extra two hours of ME time thanks to a two-hour delayed opening at my office. I debated going into the office early, but rejected that idea quickly. Our friend comes to the house every Tuesday to watch Teddy and her son, so extra Teddy time was out. It’s miserably cold outside (hence the two-hour delay) so taking a walk or a jog is out. Inevitably I end up spending my ME time doing one of my two favorite things: reading or writing. On weekend days, Teddy naps for an hour or two in the afternoon. That’s a solid chunk of ME time, and I usually set it aside for reading or writing. The thing is – I feel a little guilty when I decide to read instead of write. If writing’s my dream, and I need practice and commitment and hard work to achieve my dream, then shouldn’t I focus on that for all or most of my precious ME time? No. Reading is my inhale and writing is my exhale. If I never inhale, how can I exhale? If I never read, how do I feed the part of me that fell so in love with the written word that I feel compelled to write myself? This weekend, I experienced this conflict, and ended up typing away on the blog and taking little breaks to read. It helped that the book I was reading was Story Craft, a nonfiction book about writing narrative nonfiction stories. It feeds both my love of reading and my motivation to get better at writing. Usually I read fiction and I write nonfiction. This has been my pattern for several years. Lately, this has flipped. I’m devouring nonfiction – memoirs, books about writing – and busily writing short stories whenever I get the chance. I love the feeling I get when I have a good idea for a short story. I get a little obsessed – but in a good way, not a oh my gosh what am I going to do with my wild precious life way. No short story ideas are consuming my mind currently, however, so I’m taking the opportunity to do a little writing about myself. I learned how to crochet when I was 20 years old. I’d just started a year with AmeriCorps, and a few of my fellow Corps members were volunteering for a local charity, crocheting or knitting hats or baby blankets for children and families in need. A friend taught me, and then everyone in my family got a scarf for Christmas. I still crochet, almost 15 years later. I’m not much more advanced than I was back then; most of the things I create are square. I’ve been working on a baby blanket on and off for the past year. I make a little progress every Monday morning, when I have a standing meeting with some good friends to drink coffee and share. There’s a thing that happens when you’re crocheting. Yarn gets tangled. Even if you’re really careful – yarn gets tangled. And it doesn’t just get a little tangled, at least not in my world. It somehow comes to life and enters into a passionate samba that results in yarn criss-crossing back and forth through my crochet bag, on the floor, around the legs of the table holding my coffee, and then weaving back together into a giant, unmistakable, unavoidable knot. I’m accustomed to these knots. When I notice them, I sit patiently and untangle a little at a time. I don’t rush; if I start to notice that I’m not making progress, I tear the yarn, remove the knot, and tie the two new ends together, and continue crocheting. The first time I heard this, I paused. I lose my mind a MINIMUM of five times monthly. And that is generous. I would say, more honestly, that I sometimes lose my mind every single day. But this particular issue – tangled yarn – does not make me lose my mind. Clearly I have reached enlightenment, even if it’s just in this one uber-specific area of living. But usually, in my life, I’m more like that friend. I rip and I tear at the tangled yarn. I spend days agonizing over how the damn yarn got tangled in the first place, and beating myself for allowing the tangling to occur. This week, however, something has shifted. I have the same ‘problems’ I had last week. But I’m not trying to mentally wrestle them into submission. I’m patiently and calmly untangling threads with little stress or worry. Nothing has changed but my attitude and my approach. And I’m incredibly grateful for the mental reprieve.